Tamale recipes vary from place to place, person to person. In the Mississippi Delta, no two people make hot tamales exactly the same. Pork is traditional. Some folks use beef, while others prefer turkey. Some boil their meat, while others simply brown it. Some people use masa, while most prefer the rough texture of corn meal. Most wrap in corn shucks, while a few have turned to the less expensive parchment paper. Some season the tamale in just one way, while many will season the meat and the meal, as well as the water used to simmer the rolled bundles. Some eat theirs straight out of the shuck, while others smother them in chili and cheese. Whatever the variation, we offer you this basic tamale recipe to get you started. Below the recipe, you will find our “Hot Tamale How-To.” Each step in the process is illustrated with photographs taken from our oral histories. 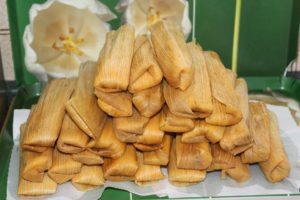 We hope that, in addition to buying tamales from our friends on the Trail, you will experiment in your own kitchen and develop an even greater appreciation for the work involved in making a Mississippi Delta Hot Tamale. Cut the meat into large chunks and place in a large, heavy pot. Cover with cold water. Bring to a boil over high heat. Cover the pot, reduce the heat to medium-low and simmer until the meat is very tender, about 2 to 2 1/2 hours. Remove the meat and reserve the cooking liquid. When the meat is cool enough to handle, remove and discard any skin and large chunks of fat. Shred or dice the meat into small pieces. There should be about 14 to 16 cups of meat. Heat the vegetable oil in a large, heavy pot over medium heat. Stir in the chili powder, paprika, salt, pepper, cayenne, onion powder, garlic powder and cumin. Add in the meat and stir to coat with the oil and spices. Cook, stirring often, until the meat is warmed through, about 7 to 10 minutes. Set aside. While the meat is cooking, soak the husks in a large bowl or sink of very warm water, until they are softened and pliable, about 2 hours. Gently separate the husks into single leaves, trying not to tear them. Wash off any dust and discard any corn silks. Keep any shucks that split to the side, since two small pieces can be overlapped and used as one. Stir the corn meal, baking powder, salt and lard together in a large bowl until well blended. Gradually stir in enough warm liquid to make soft, spongy dough that is the consistency of thick mashed potatoes. The dough should be quite moist, but not wet. Cover the bowl with a damp cloth. Remove a corn husk from the water and pat it dry. Lay the husk on a work surface. Spread about 1/4 cup of the dough in an even layer across the wide end of the husk to within 1 inch of the edges. Spoon about 1 tablespoon of the meat mixture in a line down the center of the dough. Roll the husk so that the dough surrounds the filling and forms a cylinder or package. Fold the bottom under to close the bottom and complete the package. Place the completed tamales in a single layer on a baking sheet. Repeat until all dough and filling is used. To simmer: Stand the tamales upright, closed side down, in a large pot. Place enough tamales in the pot so that they do not fall over or come unrolled. Carefully fill the pot with enough water to come just to the top of the tamales, trying not to pour water directly into the tamales. Bring the water to a boil over high heat. Cover the pot, reduce the heat to medium-low and simmer until the dough is firm and pulls away from the husk easily and cleanly, about 1 hour. 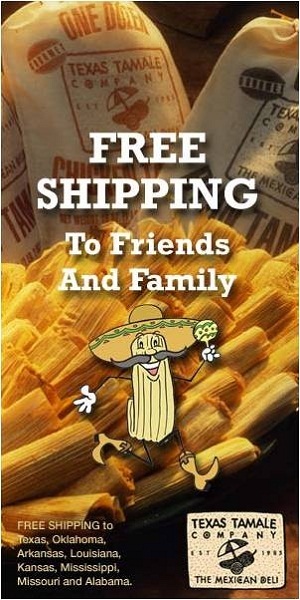 To steam: Stand the tamales upright, closed side down, in a large steamer basket. Cover the tamales with a damp towel or additional husks. Steam the tamales over simmering water until the dough is firm and pulls away from the husk easily and cleanly, about 1 to 1 1/4 hours. Serve tamales warm, in their husks. Remove husks to eat.